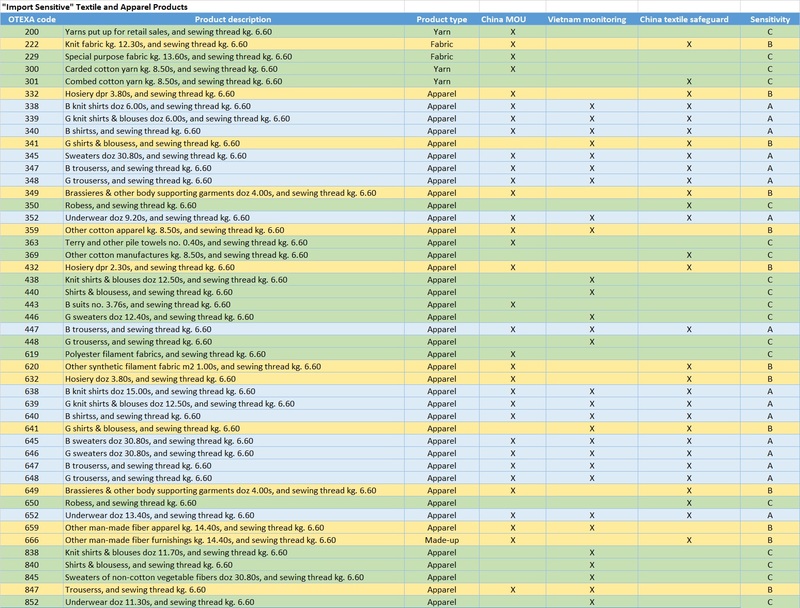 The United States includes as many as 38 different types of phaseout schedule in TPP and 8 of them apply to the textile and apparel (T&A) sector. In general, T&A products with lower base tariff rate seem to be given more generous phaseout treatment than T&A that are subject to higher base tariff rate. For example, although T&A products under category EIF can immediately enjoy duty-free treatment once TPP takes into force, their base tariff rate is also the lowest (7.9% on average). In comparison, whereas T&A products under category US6, US7, US8 and US9 are subject to the highest base tariff rate, they are given the least generous tariff cut (i.e. 35%) once TPP takes into effect. This will makes average tariff rate applied to these products remain the highest almost throughout the whole phaseout period. It should be noted that even though US11 apparently seems to be the most restrictive phaseout category (i.e. 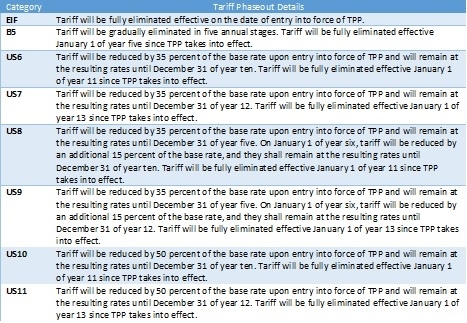 50% cut on day 1 and the resulting rate will remain unchanged until the end of year 12), its average tariff rate actually will be lower than phaseout category US6, US7, US8 and US9. In the following table, the U.S. phaseout schedule for T&A in the released TPP text based on the 8-digit Harmonized System (HS) code is matched with the Office of Textiles and Apparel (OTEXA) product category. Results show that products equivalent to around 37.5% of the value of U.S. textile and apparel imports from Vietnam in 2015 will enjoy immediate duty-free treatment once TPP takes into force (i.e. EIF), approximately 4% will be subject to medium-level protection (i.e. EIF+B5) and 58.6% are under high (i.e. EIF+ any of the followings: US6, US7, US8, US9, US10, US11) or very high level of protection (i.e. any of the followings: US6, US7, US8, US9, US10, US11). Note: “Level of protection” in the above table is defined as the following: 1) Low level of protection: EIF only; 2) Medium level of protection: EIF+B5; 3) High level of protection: EIF+any of the followings: US6, US7, US8, US9, US10, US11; 4) Very high level of protection: any of the followings: US6, US7, US8, US9, US10, US11 only. 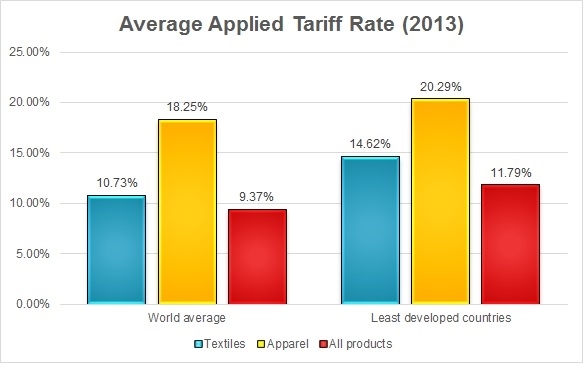 In 2013, average applied tariff rate remained at 10.73% for textiles and 18.25% for apparel worldwide. Compared with the average tariff rate for all sectors, the rate for textiles on average is 1.4 percentage points higher and the rate for apparel is 8.9 percentage points higher. This implies that although tariff may not be a critical trade barrier for some sectors anymore, it still significantly matters for the textile and apparel sector. 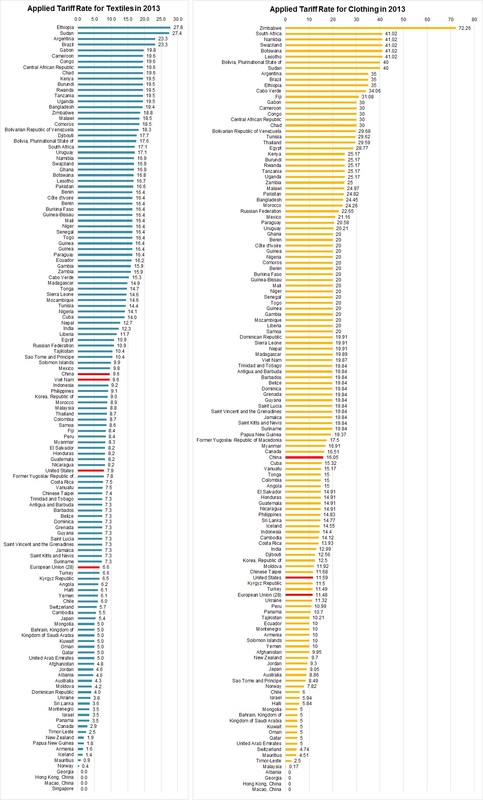 Least developed countries (LDC) overall set a higher tariff rate for textiles and apparel than the world average level. Ironically, many LDCs heavily rely on imports for textile supply. Should these LDCs lower their tariff rate for textiles, it may help apparel manufacturers there save sourcing cost for yarns and fabrics and improve the price competitiveness of finished apparel products. At the country level, countries with the highest tariff rate for textiles include Ethiopia (27.8%), Sudan (27.4%), Argentina (23.3%, Brazil (23.3%), Gabon (19.8%), Cameroon (19.6%), Chad (19.6%) and Congo (19.6%). And countries with the highest tariff rate for apparel include Zimbabwe (72.26%), South Africa (41.02%), Namibia (41.02%), Swaziland (41.02%), Botswana (41.02%), Lesotho (41.02%), Bolivia (40.0%), Sudan (40.0%), Argentina (35.0%), Ethiopia (35.0%) and Brazil (35.0%). Interesting enough, many of these countries are members of the African Growth and Opportunity Act (AGOA) which are eligible for the third country fabric provision. The following discussion questions are proposed by students enrolled in FASH455 (Global Apparel & Textile Trade and Sourcing) Fall 2015 after learning the unit on textile and apparel industry & market in the Asia-Pacific region. Please feel free to leave your comment and engage in our online discussion. We’ve heard so much about China’s superior involvement in the textile & apparel sectors globally, but how are these industries contributing to the local economy? As rules on working conditions and minimum wage have been enforced in Mainland China many business people have moved their operations to Southeast Asia, do you think the Southeast Asia will eventually become like mainland China forcing businessmen to seek low wages elsewhere? Will Vietnam shift its sourcing of yarns and fabrics from China to US after TPP? What are some setbacks associated with this? What are some potential opportunities? While Vietnam is currently one of the primary exporters of apparel to the United States, what should be the actions taken by the United States if they continue to “refuse” to cut out Chinese Textiles? Or, should the United States continue their trading patterns with Vietnam despite their reliance on Chinese Textiles? 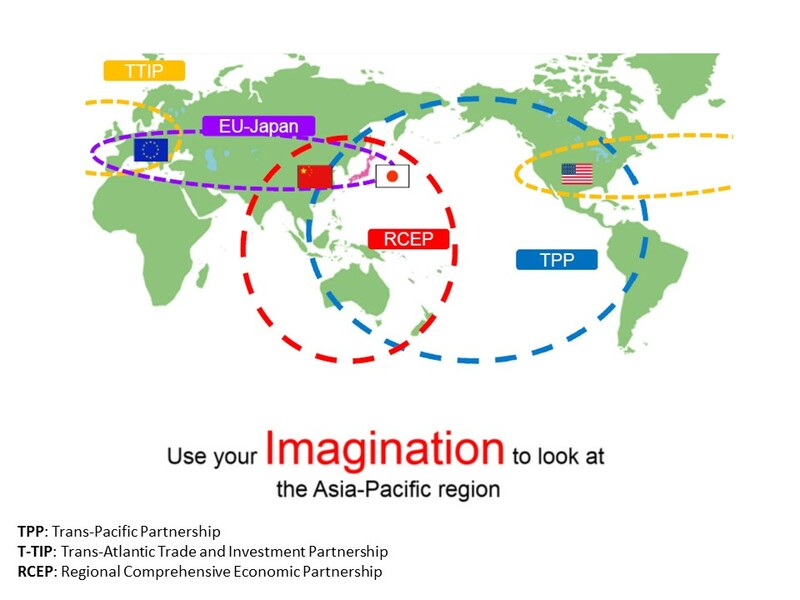 The Asia pacific region is made up of a variety of countries with different strengths and political infrastructure. How does the variety of policies and governments affect how we do business abroad, and is there a way to set standards that are not individualized to each country? China and the US can be seen as a threat to one another. However the president of China said the “Pacific Ocean has enough space for the two large countries”. Do you think they are threats to each other, or are they ultimately helping each other’s economies grow? What will happen as more and more countries that used to produce apparel move into producing more capital intensive production? What are the advantages or disadvantages of excluding China from international trade agreements such as TPP? If the T&A industry in China is envisioned by policymakers as beginning to focus more on technical textiles, how will the textile industry in China compete with the industry in the United States? Why has East Asia become one of the most economically interconnected regions in the world? What are some of the reasons that China still remains one of most price competitive export markets in the World? Also, does China face challenges in losing their top spot as leader in price competitiveness? If so, what are some of the reasons they are in danger of competition? How is the discussion about yarn forward rules of origin different in regards to TPP countries than the same discussion between the NAFTA/CAFTA-DR countries? [Discussion for this post is closed]. According to Inside U.S. Trade (October 9, 2015), the final TPP reflects some of the key priorities of the U.S. textile industry by allowing limited exceptions from the prevailing yarn-forward rules of origin and by including tariff phaseouts for “sensitive apparel items” of 10 to 12 years. An “earned import allowance“ program for cotton pants made in Vietnam from third-country fabric by importing a specified amount of U.S. cotton pants fabric. This would allow cotton pants from Vietnam would enter the U.S. duty-free as soon as the agreement is implemented. It is said the ratio for the program is “close” to 1:1. However, for men’s cotton pants, there could be a 15 million square meter equivalents (SMEs) annual cap until year 10, after which it will increase to 20 million. There is no quantitative limit for the other types of cotton pants that can be shipped under the program, such as women’s, girls’ and boys’ pants. A limited list of cut-and-sew items that Vietnam and other TPP countries can ship to the U.S. under the preferential TPP duty rate. These include synthetic baby clothes, travel goods including handbags, and bras. 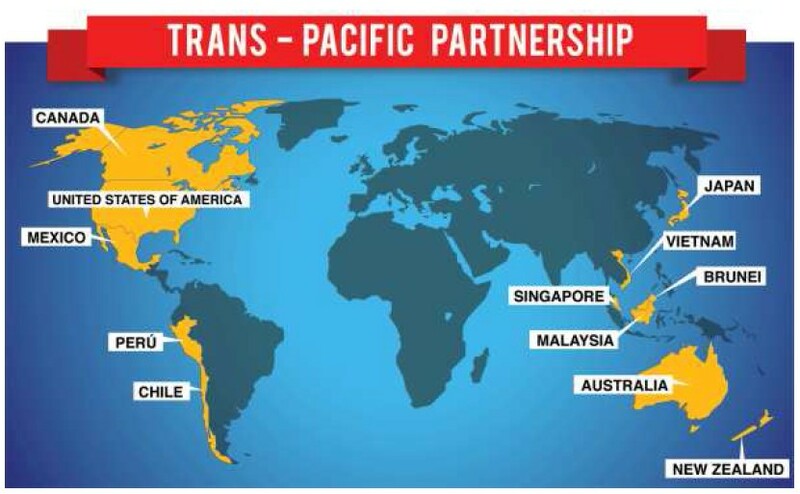 Statistics show the 12 TPP partners altogether imported $65 billion worth of textiles and $154 billion worth of apparel in 2013, which accounted for a world import share of 20 percent and 32 percent, respectively (WTO, 2015). In 2014, around 55 percent of U.S. textile and apparel exports (or $13.3 billion) went to the other 11 TPP partners, and 17 percent of U.S. textile and apparel imports (or $17.8 billion) came from the TPP region (OTEXA, 2015). TPP overall will have a negative impact on U.S. domestic textile and apparel manufacturing. In all simulated scenarios, the annual manufacturing output in the United States will decline by $846 million–$3,780 million for textile and $1,154 million–$1,828 million for apparel than otherwise. 2.The “yarn-forward” rule may not substantially benefit U.S. domestic textile and apparel manufacturing as some people had suggested, for two reasons: 1) results show that Vietnam is more likely to use Japanese textiles than U.S. textiles when yarn-forward rule is in place. 2) U.S. apparel imports from Vietnam directly compete with those imported from NAFTA and CAFTA regions, the largest export market for U.S.-made yarns and fabrics. When NAFTA and CAFTA’s market share in the U.S. apparel import market is taken away by Vietnam, U.S. textile exports to NAFTA and CAFTA will decline anyway, regardless of whether Vietnam uses U.S.-made textiles. 3.Results suggest that compared with the “yarn-forward” rule, development of Vietnam’s local textile industry will have an even larger impact on the future of U.S. domestic textile and apparel manufacturing. Particularly, when Vietnam becomes more capable of making textile inputs by its own, not only Vietnam’s overall demand for imported textiles will decline, but also Vietnam’s apparel exports will become even more price-competitive in the U.S. as well as the world marketplace. 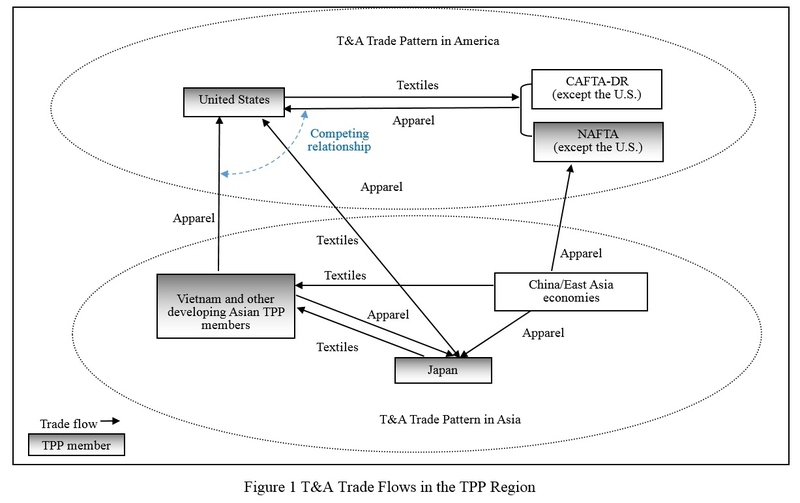 Based on examining three recent trade programs, including: U.S. International Trade Commission (USITC) monitoring program on T&A imports from China based on the U.S.-China Textile Memorandum of Understanding (MOU) (2008—present), Office of Textiles and Apparel (OTEXA) monitoring program on U.S. T&A imports from Vietnam (2007-2008) and U.S. textile safeguard measures against China (2003-2005), it seems “import sensitive” T&A in the United States mostly refer to cotton and man-made fiber apparel and fabrics. OTEXA product Code 338, 339, 340, 345, 347, 348, 352, 447, 638, 639, 640, 645, 646, 647, 648 and 652 are most likely to be included in the TPP X-basket. By the most conservative estimation, i.e. the X-basket only covers Category A “import sensitive” apparel products, it will affect about 41.6 percent of U.S. apparel imports from Vietnam (or 38.7 percent of total U.S. T&A imports from Vietnam) if trade pattern remains the same as in 2014. In the worst case, i.e. the X-basket covers all “import sensitive” T&A products identified by this study, it will affect about 70.0 percent of total U.S. T&A imports from Vietnam, if trade patterns remains the same as in 2014. 72 percent expect to source more textiles and apparel from TPP partners, suggesting the imminent impact of TPP for the U.S. fashion industry could be trade creation. Fewer than 10 percent expect to source less from non-TPP members after the implementation of the agreement, suggesting the trade diversion effect of TPP could be limited. 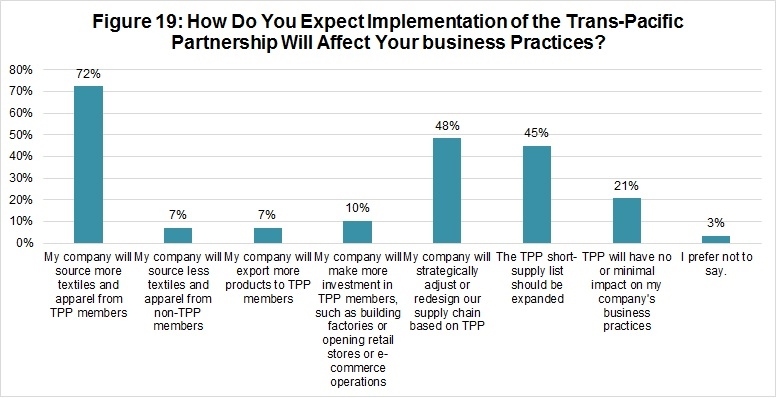 48 percent expect to strategically adjust or redesign their supply chain based on TPP, implying TPP could be a game changer and has the potential to shape new patterns of textile and apparel trade in the Asia-Pacific region in the long term. However, as few as 7 percent expect to export more products to TPP partners, while only 10 percent expect to invest more in TPP partners (building factories, operating retail stores and e-commerce operations) after implementation of the agreement. It seems the U.S. fashion industry hasn’t focused much on TPP’s potential to promote exports and achieve greater market access. Additionally, 45 percent say the TPP Short-Supply List should be expanded, and comments indicate the proposed “yarn-forward” Rule of Origin is a major hurdle to the industry realizing real benefits from the agreement. In fact, as many as 83 percent support or strongly support abandoning the strict “yarn-forward” Rule of Origin and adopting a more flexible one in future FTAs (Figure 21). This suggests that the benefit of TPP for the U.S. fashion industry and the utilization of the agreement will largely depend on the Rule of Origin. In particular, there is a strong call among U.S. fashion companies to make the textile and apparel Rule of Origin less restrictive and more flexible in TPP. Why does the US Textile Industry Want Yan-forward Rule of Origin (RoO) in TPP? 1) Without yarn-forward, situation will get even worse. Particularly, a less restrictive RoO will make Vietnam’s apparel exports which contain textiles made in China, Taiwan or South Korea qualified for duty free access to the US market. Definitely this will be a more imminent and bigger threat to the US textile industry than simply facing competition from Vietnam’s apparel which contains Japanese made textiles. And still many US textile companies don’t treat the Japanese textile industry very seriously, although I think they should. Remember, Japan currently is the fourth largest textile supplier to Vietnam and the NO.1 textile supplier to China. 2) With yarn-forward RoO in place, at least US textile companies can invest in Vietnam (remember, globalization is about movement of capital as well. Many apparel companies in Mexico and Central America actually are invested by US companies). Without yarn-forward RoO however, Vietnam can simply rely on imported textiles as the case mentioned in (1) and there will be no incentive for US textile companies to move factories to Vietnam (meaning, capital holders will lose). So overall yarn-forward RoO may win a few more years for the US textile industry. But in the long run, it is my view that the US textile production and its exports to the Western Hemisphere countries may still inevitably decline (especially those output to be used for apparel assembly purposes) after the implementation of TPP. In the 21st century, the nature of competition is supply chain v.s. supply chain.